Enjoy an intuitive patient feedback survey app. Seamlessly collect feedback from your patients on any device. No internet needed! Use a mobile patient feedback form to collect data anywhere, even if you're offline. QuickTapSurvey works on all Android and iOS devices. Protect your patient surveys with powerful data encryption, and ensure only authorized users have access to certain forms and functions. Create professionally branded surveys in minutes. No technical skills needed. Add your clinic's logo, use your brand colors, and much more. Use a variety of field types to collect patient data, including email capture, signature capture, rating scales, NPS or CSAT scoring, and more. Send personalized emails to your patients thanking them for sharing their experience, and encourage them to take any needed next steps. Get a live pulse of your patients with daily, weekly, and monthly satisfaction reports created with Net Promoter Score (NPS) and CSAT scoring. Transform tablets into kiosk. to let your patients complete feedback surveys at the front desk. Instant notifications will alert you to uptime issues. Allow patients to complete their patient feedback survey in the language of their choice. International keyboards make data entry fast and easy. Use automated emails to inform staff members of new submissions and ensure negative patient feedback gets addressed as soon as possible. Connect your patient feedback survey to apps such as Salesforce, MailChimp, and Zapier for easy data management. Organize patient emails in your email marketing system, add new patient details to your CRM, route feedback data to spreadsheets and other documents, and much more. Easily create your own surveys from scratch, or get started immediately with one of our ready-to-go templates. Managing your reputation is key to running a successful hospital or practice. Use these 3 guides to make the most of patient reviews. 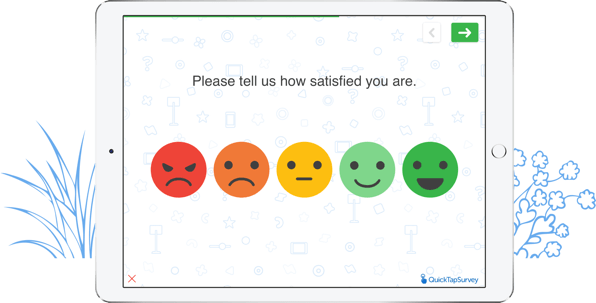 See QuickTapSurvey's patient feedback survey app in action by starting a free trial. No credit card required.